1 :: Winter Wishes :: You might remember last year I bought a gift for a nine-year-old stranger who wasn’t going to be getting any presents. The deadline for this year has closed, but you can buy gifts directly from Amazon Wish Lists and they’ll be delivered to the kids across the city in time for Christmas. 2 :: New York Cares Coat Drive :: I’m all for donating old clothes rather than throwing them out, and this brilliant annual initiative by New York Cares is a great way to help people in need stay warm this winter. 3 :: Make-A-Wish :: Each Christmas, Macy’s raises funds for the Make-A-Wish Foundation, which gives treats to critically-ill children. For every letter written and taken to Santa at Macy’s Santaland at 34th Street, the company will donate $1 to the charity. You can also send a letter by email. 4 :: Give food :: Help families get enough to eat this Christmas by dropping off tins or packets at City Harvest. You can also volunteer there or other great projects, such as CityMeals-on-Wheels for the elderly. 5 :: Toys for Tots :: The U.S. Marine Corps Reserve collects new toys throughout the month and then hands them out to children in the community. Find out more about drop-off spots here. 6 :: Volunteer :: There are tons of holiday projects with New York Cares – from helping decorate children’s Christmas parties to serving hot food at soup kitchens – and they always need more volunteers! And finally :: Donate! :: Why not pop a donation to your favorite New York institution or charity in time for the end of the tax year? Places from museums to city parks need dollar to stay looking pretty. My go-to will always be animal shelters, which are overwhelmed in the city. I’ve just bought some tinned food and blankets off the Wish List for Sean Casey’s Animal Shelter in Brooklyn, and I’ll make sure I take some biscuits to Animal Haven before the 25th. 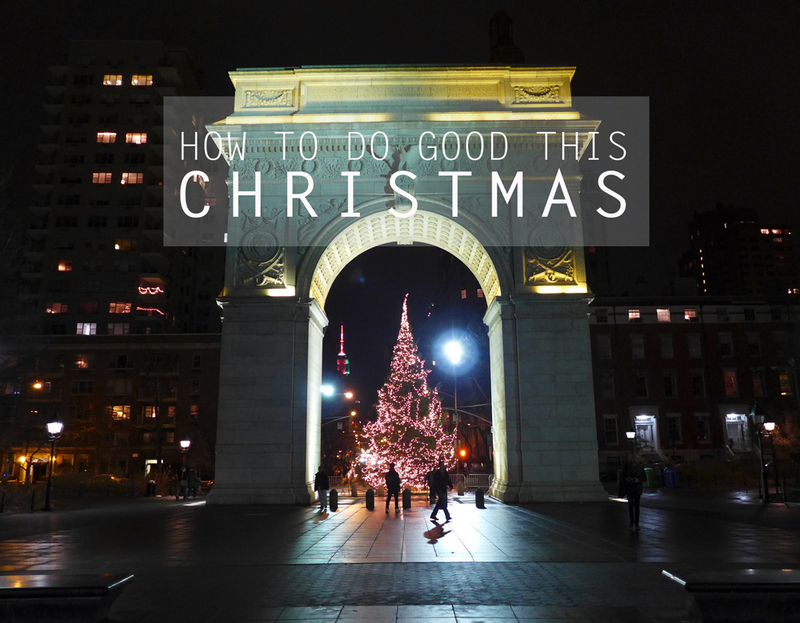 Of course, there are plenty of other ways to do good this Christmas season – from simply being considerate when we’re all crammed on the subway to tipping a little more. And guys, do you realize… in six days, it’ll be Christmas?! Thank you so much! And thanks for following my blog this year 🙂 Merry Christmas to you and your fam too!